Lowest Cost Installed All of our DLJ multi-jets come with the male NPT couplings, so there are no hidden charges when you place your order. All meters are available registering in US Gallons, except for the DLJ7575 which you can order in US Gallons or Cubic Feet. Same Day Shipping We pride ourselves in our ability to fill our customer's orders and get them shipped out same day. If you place your order by 2pm Eastern Time and the item is in stock, it will ship that day. Our UPS ground charges for the DLJ50 - 100 are $14 for the first meter, $5 each additional. The UPS ground charges for the DLJ 150 and DLJ 200 are $22 for the first meter, $9 each additional. Our shipping costs have increased slightly due to the rising costs of transportation and the unstable fuel markets. Options The DLJ line of multi-jets are available with dry contact (reed) pulse outputs. This enables them to be tied to a remote LCD or a PLC for data collection and consumption analysis. The pulse rates are standardized by meter size and specifications can be found on the meter spec sheets. Hot water models good to 194 degrees are also available with and without pulse outputs. 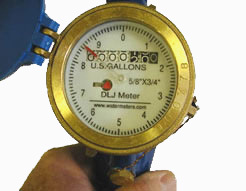 If installation is tight, try our DLJSJ single jet water meters. 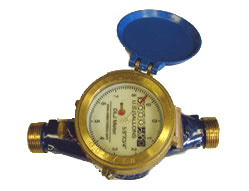 If you have higher flow rates or larger line sizes, try our DLJ Turbine Water Meters, available from 2" - 20"
2. You can call us at 800.654.3733 from within the US or 201.487.7444 from overseas. We accept Visa, MC, Discover or American Express over the phone. 3. You can fax your order to 201.487.3953 with your credit card information (we will need the credit card security code to process your order) . We also readily accept Purchase Orders from schools, hospitals, municipalities, and state and federal government organizations. If you have any questions about specifications, please call us.